It seems like a lot of people are looking at August as a fresh start. My Facebook and Instagram feeds were full this morning of people recommitting themselves to eating better, being more organized, and getting back on track with their goals. That makes me think that I can't be the only person who had a frustrating July, which is a little reassuring. I had aimed to read five books this month, but only got through three. But, the good news is I should finish two this week alone. 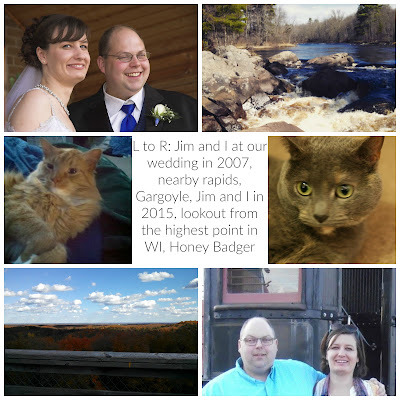 Here's my monthly recap of what I managed to finish and what found its way home with me. Missing You from Harlan Coben. It was my first try at his books and while the story was fast passed and kept me reading, it was just a little too ridiculous. I was trying to explain the plot line to a friend and she just started laughing. It's kind of like Castle or 24 or any action packed television show. While you're watching, you can suspend belief and enjoy the ride, but afterwards it's all just a little bit too much. We Wish to Inform You That Tomorrow We Will Be Killed with Our Families by Philip Gourevitch, This book took me a couple of months to get through, but I finally made it. While the first third is all about the Rwanda genocide- what led up to it (going back hundreds of years), the principle players, stories of survivors, heroes, and the like, the rest of the book is about the aftermath. I was in late grade school, early junior high, when all this was going down so I don't really remember it, but realizing how the UN sat on their hands and watched all this happen is just unbelievable. Even more mystifying was how after the outside Tutsi army finally pushed the Interahamwe out of Rwanda, the Interahamwe were treated as victims by the UN, Red Cross and relief groups, even though they had started the genocide and directly murdered hundreds of thousands of innocent people. It was such a interesting book, but so frustrating, and made me despise politics even more than I had. The Lake of Dreams by Kim Edwards was not as sappy as I thought it was going to be. But, I could totally see it being made into a Hallmark movie, especially if thy softened it down a little. It was an interesting read and I was satisfied with the ending, even though I thought I wasn't going to be when I saw it coming. Feeding off last week's top ten, it made me want to lean more about stained glass and the process that goes into making it. Something Rotten by Jasper Fforde. This is book four in Fforde's alternative universe, Thursday Next series. I'm really looking forawrd to finding out what Thursday is up to. I've been looking for this book for a couple years and was excited to finally find it! Find Your Extraordinary by Jessica Dilullo Herrin is all about following your dreams and I think it'll be a good read with all the job uncertainty I feel coming. The Husband's Secret by Lianne Moriarty was found at a local thrift store. After the roller coaster of What Alice Forgot, I'm reading to job on for another ride. Moriarty rights this rug pulled out from under you books that make you ask what you would do in the same situation. Simplify Your Life, And Get More Out of It by H. Norman Wright was found at the same thrift store. I'm still working at decluttering, but I was drawn to this book because it also deals with uncluttering your mind. Something I feel like I could use some help with. How about you? Find any great books in the last month? Or finally track down something that's been on your reading list for a while? 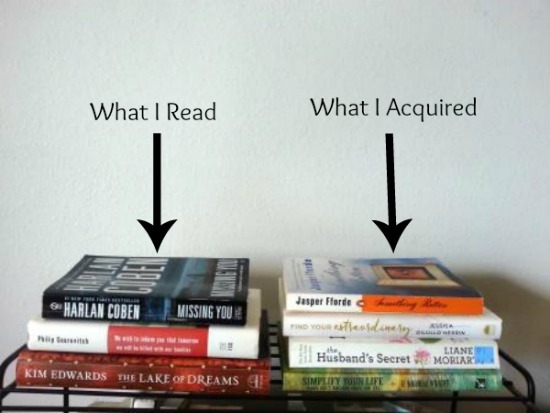 I love the way you sorted your books in the picture! Clever girl...! I'm not good with the graphics, wish I was! Need help. I have never read anything by Harlan Cohen, my bad. I know. You have stunning selection here. Hope your August reading will be great fun! Thanks for stopping by at Mareli Thalk in - much appreciated. Thanks Mareli! Missing You was pretty fluffy, so I don't think I'll be searching out any of his other books, but I could see them making good beach reads.